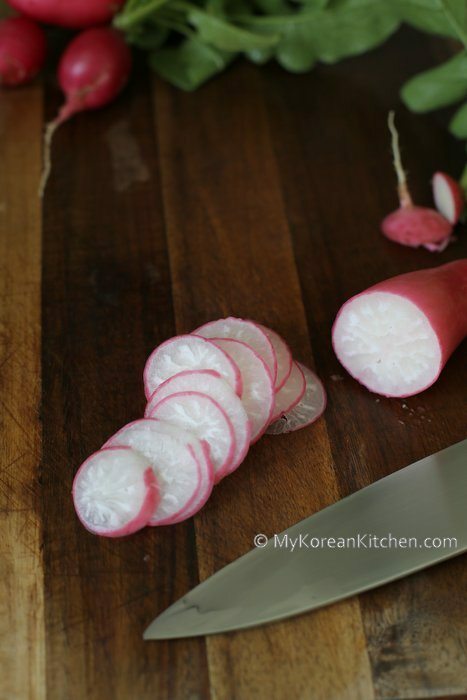 How to make Korean style radish pickles using pink radish. It’s simple, easy and moreish! Do you like radish pickles? I love them! It’s such a gem dish. I particularly love pairing them with my Samgyeopsal (Korean pork belly) BBQ meat and also with Bibim Naengmyeon (Korean spicy cold noodles). I have also tried these with Bibimbap, and I think it will also be a great companion dish to KFC (Korean Fried Chicken) too! I don’t know much about wine or cheese, but I think it’s equivalent to pairing chardonnay with camembert cheese. It adds delicately pleasant sweet and sourness and crunchy texture to my favourite Korean dishes above and I simply can’t have enough of them each time! What is Korean Style Radish Pickles? Typically a daikon (white) radish is used for a Korean version of radish pickles; however, it’s often not that easy to find daikon radish where I live. So not long ago, my husband planted some pink radishes in his small garden patch, and it only took about 3 weeks to grow and harvest them. So I decided to make some radish pickles with that fresh harvest! By now, you might be wondering, what’s “Korean style” about these radish pickles? Truth be told, there’s nothing particularly Korean about my radish pickles regarding the ingredients used (there’s no gochujang or gochugaru involved!) or the method of cooking. However, it does have the same sweet and sour taste that I’m familiar with, and it also goes well with other Korean dishes as I mentioned above. It’s quite possible that all radish pickles taste the same as this (do they?) but I decided to give it the “Korea style” name tag. However, I’m also hoping to present to you a daikon (white) radish pickles recipe when I can get it in the near future. Essentially though I would use the same vinegar mixture as with my pink radish pickles and based on my previous experience, they should give the same taste as with the pink radish pickles except that each pickle slice is bigger. I hope you get to try this recipe soon! 1. Rinse the radishes in cold water and clean/trim the root and stems. 2.Thinly slice the radish bulb and set aside. 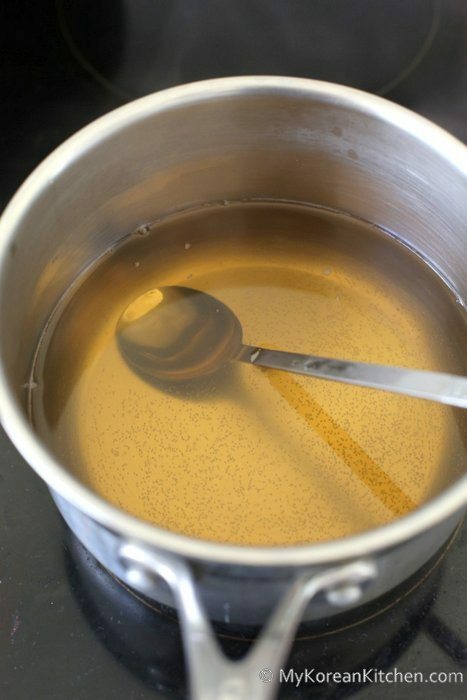 3.Make the vinegar mixture in a small sauce pan by mixing them all and bring it to boil on low heat until the sugar melts (about 3- 4 mins). You can whisk it occasionally to promote the melting process. 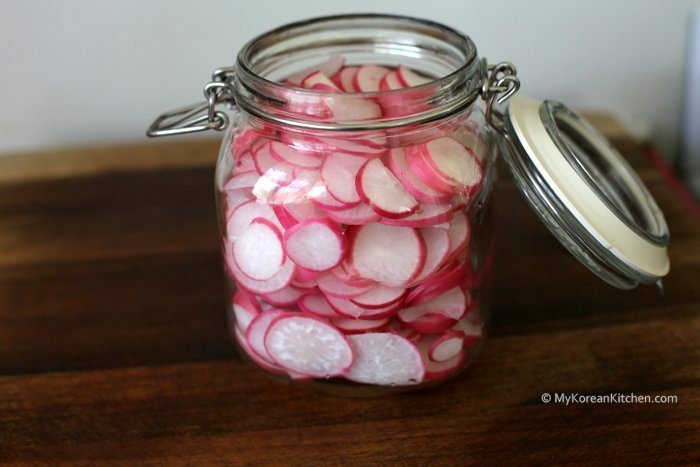 4.Put the sliced radish in a glass jar (I used a 1L jar.) and pour in the vinegar mixture. Let the jar cool down for a couple of hours and close the lid. Refrigerate the jar for overnight. 5.Serve the radish pickles when required. (I found that the pickles taste better from the 2nd day onwards rather than on day zero or one.) It can be stored in the fridge for up to 4 days with still a good taste and the crunchy texture. 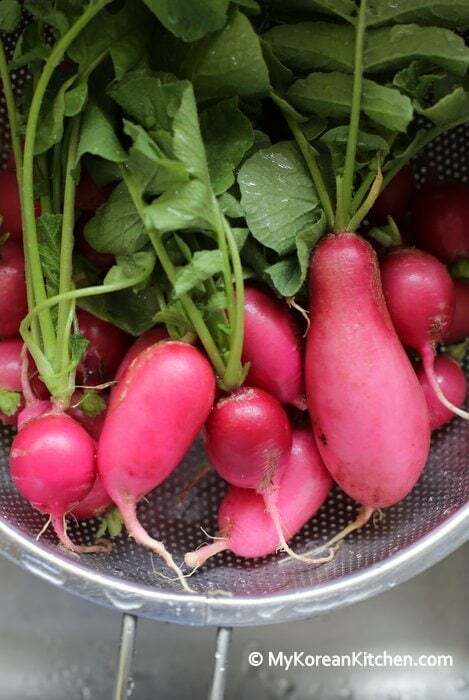 Rinse the radishes in cold water and clean/trim the root and stems. Thinly slice the radish bulb and set aside. Make the vinegar mixture in a small sauce pan by mixing them all and bring it to boil on low heat until the sugar melts (about 3- 4 mins). You can whisk it occasionally to promote the melting process. Put the sliced radish in a glass jar (I used a 1L jar.) and pour in the vinegar mixture. Let the jar cool down for a couple of hours and close the lid. Refrigerate the jar for overnight. Serve the radish pickles when required. (I found that the pickles taste better from the 2nd day onwards rather than on day zero or one.) It can be stored in the fridge for up to 4 days with still a good taste and the crunchy texture. I’ve been looking for a recipe like since I came back from South Korea. I tried it while I was eating Korean BBQ, and it was so amazing!! I’m so glad I came across this and now I can make them all the time!! Talk about a new favorite snack. A perfect recipe for one of my favorites side dishes! Thank you! Hi, I was wondering, why is it only good for 4 days? Shouldn’t the pickling make it last longer? Thanks. They look delicios! But I qas wondering what do you eat this with? 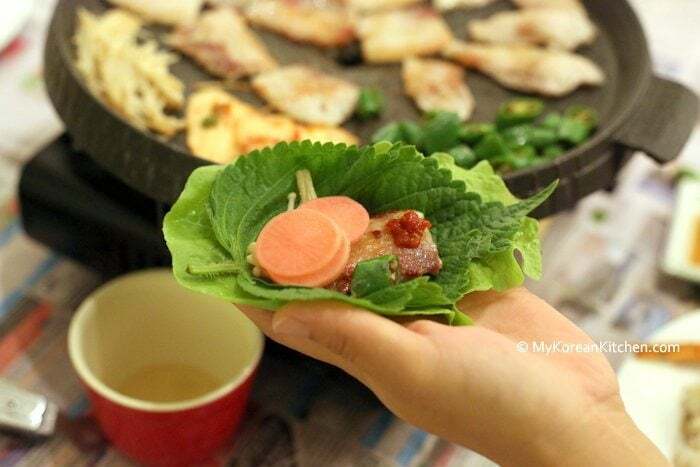 On a sandwich, with Korean BBQ, on Korean cold noodles, or as a side dish with Asian main meals. Applications are endless. 🙂 Enjoy! Hanaromart on Elizabeth St in the Brisbane CBD always seems to have Korean radish in stock, but it looks so pretty with the pink radish! 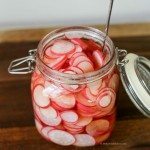 After the vinegar mixture is boiled, should we wait a bit for it to cool down before pouring it on top of the radishes which are in the jar, or just remove the boiling mixture fro the stove top and pour it into the radish containing jar? Hi Jerry, I added the mixture soon after boiling. Otherwise, I would have written it differently. The vinegar mixture wasn’t really hot (it was barely luke warm) and also the glass jar seem ok for the heat introduced by the mixture. Also, I wanted the radish to be wilted a little bit by the warm mixture too. However, I see your point. it doesn’t hurt to pay extra safety caution. Thanks! The pickle looks very pretty in pink. It is hard to get the Korean radish for some people in the U.S and I think these pink radishes can make a great substitute. What a nice compliment to any BBQ? Great job! I love pickles and actually I think I made something similar from a Japanese recipe last year. I made it also with pink radish instead of the slightly bigger white (not daikon which luckily is easy to get here). I know I come late… but congratulations on your baby girl once more!!! Thanks Sissi, I should check out your recipe shortly! Anything pickled is alright in my book! i cant wait to try yours because I am always adding garlic and I have feeling yours go very well with grilled food. Fantastic job, Sue! 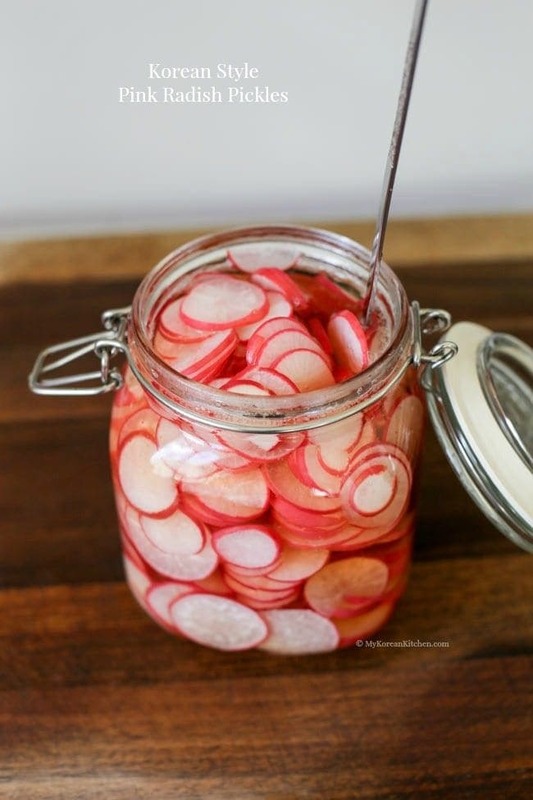 Thanks Sandra, Yes, this radish pickles go very well with grilled food! I hope you get to try this recipe.